TropSoils is a collaborative research program whose goal is to develop improved soil management technology for developing countries in the tropics. Primary funding is provided by the U.S. Agency for International Development through Grant DAN 1311-G-SS-1083-00. This action is in support of Title XII "Famine Prevention and Freedom from Hunger" of the Foreign Assistance Act. The formal collaborators are: Agency for International Development-USA; Center for Soils Research-Indonesia; Cornell University-USA; Empresa Brasileira de Pesquisa Agropecuaria-Brazil; Institut National de Recherches Agronomiques du Niger-Niger; Institute d'Economic Rural-Mali; Instituto Nactional de Investigacion y Promocion AgrariaPeru; International Crops Research Institute for the Semi-arid Tropics-India; North Carolina State University-USA; Texas A&M University-USA; University of Hawaii-USA. this challenge are clear: increase production on existing fields and bring new lands into the system. For either approach to be successful, limitations to be plant growth caused by soil constraints must be mini.mized. The goal of TropSoils is to address this issue. Formally defined, it is to develop and adapt improved soil management technology which is agronomically, ecologically and economically sound for developing countries in the tropics. requirement and maximizing the collaborative effort from all the participants a major goal. Identifiable inputs by all components have been substantial and have had a major impact on the structure, operations and accomplishments of the program. The TropSoils approach is to focus segments of its program on specific agroecological zones, with primary and secondary research sites within each zone. The zones are: the humid tropics with primary sites in Peru and Indonesia and a secondary site in Brazil, the semi-arid tropics.with a primary site in Niger and a secondary site in Mali, the acid savannas with the primary site in Brazil and the steeplands, which currently is inactive. This approach evolved from the two-year planning process which preceeded its implementations. under difficult situations in developing areas and has been functional for a maximum of three years at one site and less than eighteen months at the others, has necessarily limited its technical output to-date. Nevertheless, a broad base of well-conceived and scientifically-sound projects have been designed and initiated. Many of them already are having an impact on local actions. The purpose of this report is to describe the individual TropSoils research projects that are active and to provide a rationale for their place in the program and their current status. Inclusion of data intentionally is omitted because it was not necessary for the purpose of the report and such citations would be premature for most of the projects. Administrative philosophy and procedures for TropSoils reflect the collaborative nature of the program. Thus, it involves identifiable and significant inputs by all participants. The Agency for International Development has delegated overall program and fiscal responsibility for performance to the Management Entity, an administrative unit prescribed in the organization of all collaborative research support programs. It receives guidance and recommendations on policy issues from a Board of Directors and on technical matters from the Technical Committee. The Board of Directors is composed of an administrative official from each participating university and collaborating country institution. The university representatives compose an Executive committee of the Board. The Technical Committee is formed from the Program Coordinators from each university. Evaluation Panel composed of persons with international agricultural development experience and with no affiliation with any of the participating institutions. Its reports are used by the Management Entity, the Board and the Technical Committee in assessing needs for adjustments or revisions in objectives and approaches. -/Also, Principal Investigator, Lead Institution. -/ Also, Principal Investigator, Support Institution. -/Also, Principal Investigator, Collaborating Institution. *Enrolled in a graduate program leading to next highest academic degree. A. Characterize the soil of experimental sites. because of the adoption of results. Prepared by Goro Uehara, Principal Investigator. The principal goal of the program is to uncover principles which will enable resource-poor farmers to adopt soil management practices that will increase family income and farm productivity and at the same time preserve land quality. The research strategy is designed to insure that social, cultural, economic and environmental factors that enhance adoption of a soil management innovation are made an integral part of the research plan. To achieve its goal, the project conducts a major portion of the soil management research with farmers and in farmer fields. A 100,000 hectare transmigration site in Sitiung, West Sumatra, Indonesia, serves as the project's research area. Six thousand transmigrant families and 1500 indigenous families live in the area. Large cultural and language differences between the Javanese and Sudanese transmigrants and between the transmigrants and indigenous groups present unparalleled opportunities to study the responses of different ethnic groups to soil management innovations. Inceptisols on river terraces to highly leached and impoverished Oxisols and Ultisols of the dissected peneplain. Mean annual rainfall is 2800 mm and mean annual air temperature is 260C. The tropical rain forest is gradually giving way to rubber plantations and subsistence farming by new settlers. The first large group of transmigrants settled in Sitiung in 1976. A modest home, 1.25 hectares of recently cleared land and a year's supply of food, fuel, other living essentials, seed and fertilizer awaited each family upon its arrival. Since then, five additional areas in Sitiung have been settled. Bulldozer crews continue to clear more land to accommodate new settlers from the densely populated Islands of Java and Bali. The productive land on the river terraces has long been settled and the newest transmigrants are being placed on the less desirable lands of the dissected peneplain. Indonesian government. Sitiung is typical of many transmigration sites in Kalimantan, Sulawesi and Sumatra. It is the intention of the government to transfer soil management and farming systems principles discovered in Sitiung to other transmigration sites in the country., Similarly, TropSoils is also interested in uncovering principles that will enable it to respond to requests for technical assistance for management of tropical soils worldwide. Sitiung was selected as the research site after detailed discussions between Indonesian agencies and representatives of TropSoils. The site is a representative microcosm of virtually everything that is possible in the humid tropics. To exploit Sitiung's unique biophysical and social setting, the Indonesian government has invested heavily in the program. In addition to the administrative leadership and support from CSR in Bogor, it has committed 15 scientists and technicians to the projects. The senior Indonesian scientist holds a Ph.D. degree; he is assisted by four Bachelor of Science and ten high school level technicians. among the collaborating units. The installation, monitoring and harvesting of all TropSoils' experiments are done by Indonesian technicians. An operating budget of $88,000 was allocated to the TropSoils project by the Indonesian government in 1983-84 fiscal year. A similar amount has been budgeted for the current fiscal year. senior scientists to the project--an agronomist who also serves as team leader, a social scientist who deals with the farming systems component, a soil scientist--and two graduate students. The project is also assisted by university-based scientists from the U.S. institutions who share research responsibilities with scientists in the field. The major research sites have been chara cterized for soil properties and are continuously monitored for climate. The thorough, ongoing soil and climate inventory of the Sitiung area will be valuable in efforts to transfer the technology to other regions of the humid tropics. Although research is currently conducted on farmers' fields, the Indonesian government has reserved 220 hectares of forested land for development into a permanent research station. It is located on the peneplain and represents the full topographic range of the region. About a third of the area is relatively flat and the remainder varies in steepness. It offers a range of landscapes for conducting land clearing experiments, which will be a primary initial emphasis. To prepare the U.S. scientists for work in Indonesia and to ensure that the group functions as a cohesive unit, a team building and language training course was conducted in Honolulu between November 7 and December 3, 1982. The group met together daily over a six-week period with approximately half of the time spent in language study. variety of subjects on campus who were involved in complementary research and introduction to conditions in Indonesia and the research site. The team also took a Myers-Briggs personality test which was designed to make explicit some of the differences in approach team members might expect from each other and the particular strengths that each team member brought to the group. Since the farming systems approach requires continuing collaboration and communication, it was essential that participants overcome the kinds of disciplinary barriers that often interfere with team efforts. The team building period served to acquaint the team members with each other and to set a stage that has facilitated continuing collaboration-both between disciplines and across cultural boundaries. acquaint them with the valuable and closely related work underway there. This trip also contributed to the team building process, as team members coped together with the challenges of remote areas. Yurimaguas provided a concrete situation in which team members first became alerted to each other's interests and areas of expertise. Although Indonesia has quality soil scientists, it lacks the quantity needed to meet the country's development needs. The Center for Soil Research has stated its desire to use the TropSoils project to identify potential candidates for advanced training. The objective is to select from the large staff posted in Sitiung, young people who demonstrate leadership qualities and interest in science. The intent is to select high school graduates for entry into Bachelor of Science program, holders of B.S. degrees for M.S. programs and individuals with M.S. degrees for Ph.D. programs. dinator and lead Indonesian scientist for the TropSoils project will be matriculating in an Australian University, and Mr. M. Subagio will be going to North Carolina State University. Mr. Santoso will be replaced by Dr. Soleh Sukmana who holds a Ph.D. degree in soil physics. Early in the project, Indonesian and U.S. scientists and administrators agreed on a research plan for TropSoils activities in Sitiung. The plan is summarized as a flow chart in Figure 1. It calls for an initial attention to survey and characterization of soil resources and farming systems in the Sitiung area. That effort is to be followed by testing of improved, alternative soil and crop management systems on farmer fields. Owing to serious soil erosion in parts of Sitiung and the need to prevent worsening of the situation, the plan also called for soil management research to reclaim the abandoned, eroded lands. survey and characterization of 220 hectare land clearing experimental site which the Center for Soil Research intends to use as a permanent research station. Improved Farming Systems (Economically, Environmentally and Socially Workable) Figure 1. Flow chart of activities for the Indonesia TropSoils Project. on both issues was positive and enthusiastic. A "Letter of Intention" was signed in February, 1980, by representatives of the Soils Research Institute, the Central Research Institute of Agriculture and Bogor University expressing concurrence with proposed research activities, work location and institutional coordination. The subgrant from the Management Entity to the University of Hawaii and North Carolina State University to actually implement the program was executed in January, 1982. In March, 1982, representatives from the two institutions and the Management Entity visited Indonesia to discuss formalization of the program and develop the appropriate legal documents. There was anticipation that all necessary approvals would be obtained by August, 1982, and, thus, recruiting of personnel and other plans were initiated by both universities. Difficulties occurred in obtaining the required actions. Considerable uncertainty on timing occurred and resulted in a number of go-stop actions on personnel posting. Final approval was obtained in June, 1983; senior scientists arrived in the country within a few weeks thereafter. In spite of these developments, with the exception of a six-month period between January and June, 1983, most of the time was used in effective start-up activities. Major constraints to on-site activities can be linked to isolation of the project area. Isolation results in real and perceived constraints in security, communication, housing, power supply and health. Security. Concern for the security and safety of team members was a major factor in Indonesian administration's reluctance to permit the team to enter Sitiung prior to formal approval of the Agreement. The concern for security exists to this day, and team members are required to sign in at the District Attorney's office when they leave and return to the area. The District Attorney's office would be in serious trouble with the Central Government if the whereabouts of a team member, injured outside the Sitiung area, were not known to the Office. The security problem is perceived differently by the team members and the district officials. The team feels secure in the village and fields, but the officials are fearful that team members will be harmed by unfriendly people from outside. located in Sumani, 2.5 hours from the research area, the team arranged to rent and upgrade homes owned by local settlers. The resulting savings in time and fuel more than compensates for the inconvenience of locating adequate housing. Communication. There is no direct telecommunication link with the team. The only telephone in Sitiung is located a few kilometers from the team's residences. Cables are received at the post office in Sitiung. A battery operated radio communication system is being developed to link team members with each other and to Padang and Bogor. In cooperation with the IADS group in Sukarami, direct telephone, cables and telex linkages have been established to a one person office in Padang. Messages received in Padang are either called or mailed into Sitiung by the office staff. Power Supply. There is no municipal electricity or water supply. Except for the kerosene refrigerators and gas stoves, household appliances and lighting are provided by diesel generators. The type of equipment purchased by the project to support a soil characterization laboratory is constrained by lack of steady and reliable power supply. Health. Two members have been afflicted with unknown ailments. One member of the University-based staff who visited Sitiung in March, 1984, was suspected of having contracted Dengue fever. Although proper precaution can be maintained at home, it is difficult for team members to reject food and drink offered by cooperating farmers. One team member has been ill for over six months and returned to Hawaii for medical help. The doctors suspected a virus and recommended a long rest, but the patient returned to Sitiung after only a short stay. Although isolation and the constraints that go with it appear formidable, team members treat them as minor inconveniences and continue their work with remarkable enthusiasm. They recognize the reality of working in a developing country is to deal with these kinds of constraints. The connection between soil management and quality of life is not lost because the constraints that affect project activities are the same constraints that face everyone in Sitiung. according to the Indonesian system of soil classification and Soil taxonomy. A large scale map (1:5000) will be prepared. Soil survey and classification is a continuing training aspect of the TropSoils project. Its main training will be in the use and adoption of Soil Taxonomy as a common international language for soil management technology transfer. A typical farm in the transmigration area varies in productivity from bare spots to green strips. The bare spots are sterile subsoil exposed by the bulldozer and the green strips correspond to the ash lines of burnt trees. This type of variability is a problem for the farmer and researcher. In farmers' fields, the bare spots are the first to erode. Bare spots produce nothing and, therefore, are neglected. Erosion feeds on neglect, and the land is eventually abandoned. If a farmer applies lime and fertilizers uniformly over a field, too little is applied to the bare spot and an overdose is given to the green strips. But because the Sitiung farmers spread farm chemicals by hand, they are in a position to vary the application rate according to need. The farmer must learn or be taught to recognize various forms of variability that causes inefficient use of scarce resource. in a liming experiment to assess the effect of aluminum toxicity on crop performance. of spatial relationships among neighboring samples. If such relationships exist, the information in the semivariogram can be used to estimate values of soil properties in unsampled locations. This additional information can be used to prepare more accurate soil maps so that problem areas can be more precisely pinpointed. a farmer's field by the TropSoils team. The samples were analyzed by the soil characterization laboratory of the Center for Soil Research in Bogor. The results show that natural soil variability can be exploited to answer key agronomic questions. Examples are available to illustrate the variability of aluminum saturation in an experimental plot and its corresponding effect on the rice crop. The data show that rice yields were significantly higher on burn sites than on exposed subsoil. A more detailed analysis shows that difference in organic matter, phosphorus and nitrogen accounted for less of the yield increase than differences in aluminum saturation, calcium, magnesium, potassium or zinc. Thus, geostatistics enabled project scientists not only to map spatial variability of soil properties to extract from the data set agronomic information that relates soil productivity to soil properties. The same technique has been employed to map agronomically important soil properties for the entire 100,000 hectares research area. The spatial variability of the amount of lime needed to correct aluminum toxicity in the Sitiung area illustrates how geostatistics can be used to identify soil constraints. Soil variability which cannot be accounted for by traditional soil survey methods can be dealt with by application of the theory of regionalized variables. This type of soil variability occurs in every agroecological zone and can be accommodated by existing computer software. These softwares are available in a dissertation that has been distributed to all SM-CRSP projects. Use of these techniques requires access to mainframe computers. It is the intent of this project to train an Indonesian graduate student in this technique when he arrives in Hawaii. Two Master of Science candidates from Indonesia have been proposed for matriculation in the University of Hawaii. physical properties of degraded soil . low and high critical levels for lime and nutrients. C. To study the effect of various tillage methods on soil physical properties and crop yields. D. To study the effect of green manures on crop yields and soil chemical and physical properties. substantial increase in rice yields at all three levels of fertility compared with the nonmanured plots. Low rates of lime and fertilizers with green manure produced considerably more than high rates without green manure. There was little difference among tillage methods, except for the strip tillage which was not as effective as the others. positive effect on yields at low rates, but gave a negative effect at high rates of lime and fertilizers. Deep spading had the most favorable effect on compaction, bulk density and water infiltration. Organic matter additions generally improved the soil physical condition compared to simple hoeing but not as dramatically as the deep tillage. rates completely eliminated exchangeable Al and brought available P to a very high level. The dramatic soybean response reflects this favorable nutrient status. firsthand the soil forming processes at work in a dynamic and dramatic situation, unlike perhaps any field condition that can be found in the U.S.
Karim Makarim is an Indonesian who is a candidate for the Ph.D.
degree at NCSU. This research will be used, in part, for his doctoral thesis. He is gaining valuable research training and will return to Indonesia. Organic matter is an important soil component, especially in highly leached and weathered tropical soils. Soil organic matter is associated with increased cation exchange capacity, improved soil structure, and is a major source of many plant nutrients. The soils in much of the Sitiung area developed under rain forests which, as a rule, maintain a tight nutrient cycle between litter decay, root uptake, and plant growth. The clearing of rain forests breaks this cycle and often leads to soil degradation through increased organic matter decomposition, leaching of nutrients, soil compaction, and erosion. Sustainable, low-input farming systems in Sitiung Indonesia must provide for maintenance of soil organic matter. This project is designed to compare farming system technologies in terms of inputs and persistence of organic matter and their feasibility and attractiveness to subsistence level farmers. An assumption to be tested is that a permanent soil cover of vegetation or mulch will best protect the soil and create a stable equilibrium between organic matter and decomposition. Hedges of legume trees cut frequently to provide mulch and legume cover crops providing vegetative soil cover will be assessed in intercropping with food crops. nutrient cycling and effect on physical and biological processes in the soil. Management of organic matter will be part of the farming system and will be incorporated in training aspects of farming systems research. The data arising from this project will also be used in training for nutrient dynamics and nitrogen transformation in crop modeling. in the Sitiung area of West Sumatra. The research will be conducted in the Sitiung transmigration area of West Sumatra. beans and (2) rice, peanuts and cowpeas. Lime rates will be equivalent to 500 kg CaCO 3/ha and rates that will give 50 and 0 percent aluminum saturation. The rates of K applied, as KCl, to each crop will be 0, 20, 40, 80, 120 and 240 kg K/ha. Plant leaf samples will be taken at flowering to determine the K, Ca, Mg and N concentration. Total plant content of these nutrients in the harvested grain and yield of grain will be determined at maturity. Soil samples will be taken at 15 cm intervals to a depth of 60 cm after each crop to determine the movement of K and the basic cations. Laboratory studies will be done on the quantity-intensity relationships of K in these soils. drying facilities, plant choppers and small hand operated tractors could hinder the quantity and quality of research. only means for supplying the needed K. These studies will provide needed information as to the amounts of K required and the soil K levels that will result from given rates of fertilizer K.
management program which provides for the efficient use of K fertilizers in highly weathered soils. Mr. Gill is a candidate for the Ph.D. degree at North Carolina State University and is interested in pursuing a career in international agricultural research. This research will be used for his doctoral thesis. The research is conducted in the Sitiung transmigration area of West Sumatra. On-farm, researcher-managed, low input trials are used. Three replications, of the following treatments were applied. additional methods of applying the fertilizer were tested at the 20 kg rate. Again there was no significant difference among the methods. addition, the variety (locally obtained from new transmigrant farmers) did not appear to be well suited to this region. At flowering and early pod set stages, the crop suffered from both leaf and wilt diseases. The current crop is mungbean. Because peanut did not show a plateau yield, all P treatments were reapplied prior to planting. Unlike peanut, this crop is exhibiting considerable within-plot variability. From other experiments we now know that mungbean is quite Al sensitive, and it is suspected that soil acidity is responsible for the variabi1 i ty. indicates little initial P fixation and that predication of available P should not be difficult. to better predict or evaluate the rates of lime and fertilizer should be used on subsequent crops. Growing three crops a year with virtually no break puts great and constant demand on laboratory facilities. We have a small functional lab (approx. 20 samples per day of pH, bases and P) for soils. This must be upgraded if it is going to meet the local demand. Also equipment for doing plant samples is very much needed. find in Bogor. It appears that the best solution to this problem is for us to have our own seed storage facilities. High oil content seeds such as soybeans and peanuts will maintain good viability in ambient conditions for only 2-3 months. The peanuts did not nodulate. We had no inoculant at planting time for peanuts. Only soybean inoculant is regularly produced in-country. No other seed or forage legume inoculant is available. Applicability of Results to TropSoils Goal: This research can help build a nationwide P soil test correlation data bank for making site-specific P fertilizer recommendations. will encourage farmers to use fertilizers and to use them effectively. non-mechanized farmers. The experiment showed that the currently recommended banding method required 275 person-hours/ha of labor, while broadcasting took only 40. Nearly all Javanese farmers hoe their land between crops anyway, so incorporation is not additional labor. Even if no tillage is done, the method of adding fertilizer in the seed hole only required 80 person-hours/ha and was equally effective as banding in improving yields (at the 20 kg P/ha rate). of determining fertilizer rates. Pre-treatment lab incubation studies, post-harvest soil analyses and correlation with treatment and crop yield exhibit the process involved in choosing and evaluating P fertilizer rates. The foundation for soil test correlation is being laid. General use of the laboratory in P determination and incubations is training the technicians in useful techniques that can be expanded and carried-on in future years. cheaper if produced on a large scale. Its principle disadvantage is that it takes a fairly significant capital investment to purchase the grinding equipment. Also, quality control may be more difficult as just about any rock can be ground and not visually distinguished from lime. only two carbonaceous materials can be heated and subsequently slaked by hydrolysis. On-farm, researcher-managed trials are used in the Sitiung transmigration area of West Sumatra. Rice did not respond to lime or tillage treatments. Initial soil reaction was pH = 4.8 with 55% Al saturation. Upland rice is expected in most cases, to tolerate such levels of acidity. The final crop of the 1983/84 season was mungbeans. This crop is very sensitive to Al toxicity and showed a strong response to lime. Harvest is currently under way, so no data is available. However, most no lime plots are bare or at best have very stunted and low- or nonproducing plants. Visually the no-till treatments are the poorest and the deep tillage are the best. Subsequent soil chemical and physical property measurements should help explain why these responses occurred. The primary constraint of this experiment is laboratory facilities. in having available plant tissue analysis data in-hand. This research is aimed at testing the effectiveness of the two most common sources of lime in Indonesia. It will also test the importance of tillage or method of incorporation on lime reaction. Soil analysis will show the distribution and movement of lime within the soil as affected by source and tillage. Liming agricultural land is a relatively new practice in Indonesia. This study should provide information for deciding on the kind of lime processing that should be developed. The general characteristics of both types are known, but field data are needed to quantify the relative reactivity and residual effect of the two sources. Burned lime may not be an economically feasible source in the U.S. or other developed countries, but can be rendered potentially competitive in Indonesia as a home or smiall-scale industry. This has obvious benefits for a country with high unemployment, and low investment funds. opposition to conventional research station experience where tillage is usually done by hand or wheel tractor. a minimum duration of three years. The source of lime was burned limestone. 2.0 T/ha. However, this difference was not statistically significant at 5% level of probability and there was poor correlation between yield and soil acidity parameters such as percent aluminum saturation, pH or Ca + Mg. This is not surprising, as upland rice is known to tolerate acid soils. The unlimed plots had an average pH of 4.6, with acid saturation of 66%. Soybeans, the second crop, showed a marked response to lime, as it is much more sensitive to acid soil. Mungbeans, the third crop, has been grown and recently harvested. are low even at high rates of lime. Marginal rainfall and leaf disease seemed to be contributing factors. The residual effect of the lime treatment when burned lime is the form applied appears to be relatively short. Seven months after its application there was a decrease in the available soil Ca and Mg and an increase in the exchangeable Al and Al saturation. The residual effect of calcitic and dolomitic lime will probably be longer because of more coarse materials being present compared with the powdered form of the burned lime. Thus, in areas of high rainfall and potential for leaching of Ca and Mg ions, the limestone should probably contain some coarser fractions in addition to some fine particles to provide a longer residual effect. maintenance plots. Then the second year's rotation will begin with a comparison of the lime response on residual vs. maintained rates. The rotation will be the same as the first year, i.e. rice, soybeans, mungbeans. without any clear cut problem being positively identified. collaborating CSR, relatively new in working in these upland, acid and infertile soils of the humid tropics. Much progress has been made in the central producing areas of Java, but materials and methods used there don't necessarily work here. We have good contact and rapport with the West Sumateran Food Crops people from Sukarami, but do not have tried and proven management practices yet developed. This experiment is providing information to begin building a database for correlating soil acidity parameters with crop growth. Eventually, we hope to define critical values for the major crops of the area so that more precise recommendations for correcting soil acidity can be passed on to government agencies. learned by the researchers and technicians involved. Also, this serves as another example of how to define and establish crop yield and soil test correlations as well as critical levels. As a service to their farmers and government agencies, this is probably one of the most lacking aspects of CSR's work. If the value of such information can be seen, then expansion and development of a nationwide program can begin. system. This project is designed to match the environmental requirements of pasture grass and legumes to (1) the environmental characteristics of the land and (2) the resource characteristics and preference of the farmer. West Sumatra, Indonesia. CIAT has a collection of pasture grass and legume germplasm ready for testing. These cultivars will be tested in Sitiung under minimum input situations. Cultivars will be selected for vigor, growth rate, pest resistance, palatability, productivity and survivabil ity. These experiments were previously arranged through contacts with CSR and CIAT personnel. Jose Toledo, Coordinator of the forage and pasture project for CIAT, provided seedstocks of several species of grasses and legumes. samples for classification of mycorrhizae. This adds to the information on mycorrhizae in the Sitiung area which Russell Yost and his graduate students in Hawaii are compiling. the native legumes of Sumatra with Ranier Schultz-Kraft who is the legume germplasm collector for CIAT. Schultz-Kraft was much impressed with the broad range of forage legumes in Sumatra and promised to return for a detailed collection and classification of local legumes. The team will be working closely with him and may utilize some of these species in the legume evaluation in Sitiung. reclaim eroded land and at the same time serve as animal feed. species now appears to be well-established. This work also has relevance to the small ruminant CRSP which is active in the country. It is highly likely that future tests of CIAT's pasture grass and legume collection will uncover many more high performance species that will serve as ground cover to protect soil from erosion, green manure, forage for farm animals and a land reclamation cover crop. Bogor grew well also, even taller than Wilis, but the seed was very small and yields were lower than Wilis. Orba, the most common improved variety in Indonesia, did poorly. Orba and 45 cm for Willis). of South America and Africa. Initial screening here can help select varieties suitable for testing in other tolerance-type trials such as soil infertility, insects, diseases and water stress which can be an effective means of increasing production. Also using tried and proven varieties in our management trials can help insure good yields, which, in turn, improves the credibility of our research results. choosing good varieties for our research, and it shows how the variety chosen can seriously affect or influence the results and conclusions of a given experiment. is the local farmer, it seems that in order to develop effective and acceptable technology for him, we must gain an understanding of his situation, economically, agriculturally, culturally, and his thinking, goals, conflicts, government influence, etc. Such information can then help the agricultural research develop in a way that will hopefully help optimize our work toward development of effective and acceptable technol ogy. of what to expect of these on a station with researcher management but now we test them by the user. planted between the cassava. To date only the rice harvest is complete. government packages. The rock phosphate and lime plots were to be hoed after broadcasting the rock and lime. TSP was banded in all cases. Three farmers were selected not to hoe the rock and lime. (Minang) transmigrants traditionally slash and burn for upland rice cultivation and they advocated not hoeing. They did not think it was detrimental merely a waste of time. However the situation here was somewhat different from the usual slash and burn. This forest had been felled in the rainy season and not burned. The farmers arrived and cleared the felled trees several months later during the following dry season. By then there was little dry leaf litter or twigs suitable to fire a generalized burn. Thus they had to hand cut and pile the limbs and logs. is done at our convenience when not involved in other research activities. can find more appropriate and useable technologies that can be of immediate use to other new transmigrants in neighboring or similar areas. By the close association with them, the researchers also gain insight into the goals, problems, and thinking of transmigrants. This interaction in turn should help guide the component research so as to provide more culturally and economically acceptable technology. queries. The families that were surveyed by the nutritionists included those involved in this interview series. The following represent kinds of questions that have been incorporated into the interview series: Since the people appeared to be quite interested in fruit trees, questions on the kinds, numbers and locations of fruit trees were included. In this way the existence of a variety of fruit trees already planted in people's houselots was verified, as well as the people's interest in these crops. This information is then shared with soil scientists. The team wanted a sense of whether the people in the community were experienced in agriculture so a question on land holdings and previous agricultural experience was included. About half of the farmers interviewed had been landless in Java, but virtually all had agricultural experience as laborers. At another point the team wanted to get an idea of how much money the people had brought with them. The purpose of this question was to ascertain whether they had funds to buy agricultural inputs. The whole series was designed to monitor and provide ongoing information as the team decided what would be useful. periodic input from Colfer into decisions about agricultural experimentation. collected on the agricultural production of families. The team wanted a reading on the relative wealth of Sitiung I compared to II (irrigation and no irrigation, respectively); and Sitiung V which, in contrast to I and II, is newly settled. memory. Income data were obtained to include agricul tural production that was consumed and not sold, using market prices that were obtained at the time of the interviews. not be arranged due to Colfer's illness. B. To determine how people were choosing to use their labor. C. To determine important seasonal variation in activities. all members of the household were noted. Four households were visited each day. The data are currently being entered into the computer to form a data base from which specific soil-management-related questions can be asked related to people's usual activities. The large number of observations and their random nature permit reasonably accurately general izations to the general populace. The fact that two very different transmigr-ation sites were used, one representing a long-established one and the other a newly-settled site, allow the team to ascertain important differences based on length of residence. These data will also provide a measure of the changes that occur over the course of the research. locations will have similar options for spending their time. information about how people spend their time. In recent years, there has been an increasing recognition that unpaid work has been underestimated and undervalued. This particularly affects poor people and women, and researchers have begun to develop a body of information on how people spend their time when they are not being paid. The TropSoils studies can contribute to this body of knowledge. teaching soil scientists one of the techniques for maintaining awareness of community concerns and interests. A number of CSR personnel have been involved in data collection for this study. This provides a mechanism by Aich they regularly interact with farmers, becoming attuned to their concerns, constraints and goals. This in turn effects their decisions about the kinds of experimentation that are likely to yield agricultural technology that can be used by farmers. Since 1971 The Tropical Soils Program at NCSU has operated as the international component of the Soil Science Department for teaching, research and extension. Although it has its own office and laboratory facilities, its activities are woven through the fabric of the Department, with participation of faculty members who carry both domestic and international responsibilities. Of the 41 present faculty members in the Department, 20 have had significant involvement in the Tropical Soils Program. Approximately 38 percent of the M.S. and Ph.D. degrees awarded by the Soil Science Department from 1973-1981 are based on thesis research related to tropical soils. Many of these graduates occupy key leadership positions in soil science around the world. developed and formal agreements were signed with the predecessor agencies of INIPA in Peru, EMBRAPA in Brazil and CATIE in Costa Rica. The Central American program produced the first multiple cropping research focus in this region and led to the farming systems program of CATIE. Work in the Cerrado of Brazil, conducted jointly with Cornell University, developed basic soil management technology for savanna Oxisols and was instrumental in establishing the research program at EMBRAPA's Cerrado Research Center. The humid tropical component of the program has operated for 12 uninterrupted years in spite of funding shortages and political upheavals. A strong commitment by the Peruvian research institutions, the Office of Agriculture of AID/Washington and NCSU, permitted an opportunity for continuous direct involvement of NCSU at one key location, Yurimaguas, Peru. Core funding for the program has been provided by AID through Contract AID/csd 2806 "Agronomic-economic research on tropical soils" from 1970 to 1975, by Contract AID/ta-C-1236 "Discovery of new management systems for tropical soils" from 1976-1981, and from the Soil Management CRSP since 1981.
institutions requested assistance in various ways. A change in government priorities in Peru towards development of the Selva prompted USAID/Lima and various Peruvian institutions to request our involvement in country programs involving research, extension and training in tropical soil management. The question of whether the Yurimaguas technology is applicable to the drier humid tropics in Brazil prompted a cooperative project in Manaus jointly funded by the Rockefeller Foundation, the Potash-Phosphate Institute and EMBRAPA. The emergence of REDINAA carried a request to develop an Amazon-wide soils project. A similar development for IBSRAM led to involvement in designing a worldwide acid tropical soils network. NCSU's Tropical Soils Program activities in the humid tropics have gone through several stages characterized by technical focus, involvement of collaborative institutions and funding. A summary of this development is shown in Table 1. Stage 1: The establishment phase took approximately two years between contract awarding and the initiation of field experiments. Much of the effort was geared towards reviewing the available literature and extensive travel through the Latin American tropics to establish the research priorities and a work plan. This effort culminated in a stateof-the-art publication, "A Review of Soils Research in Tropical Latin America," published in 1973 in English and Spanish. Soil characterization to understand the properties and variability of Amazon soils was also a major undertaking. The selection of the Yurimaguas Station was a consequence of such studies. Time has proven that it is indeed a site representative of the kinds of climatic, soil, vegetation and socioeconomic constraints of the humid tropics. The degree of expression of these constraints, however, varies widely within the region. During this stage, the Fertility Capability Classification (FCC) system emerged as a means for interpreting Soil Taxonomy data for agronomic purposes. Table 1. Stages of development of NCSU's Tropical Soils Program in the humid tropics. Training None Limited to NCSU graduate NCSU, UNA and European Univ. continuous cropping. Efforts concentrated on testing the hypothesis that continuous cultivation of annual food crops is possible in acid infertile soils of the humid tropics. Nutrient dynamics were followed and a series of experiments on fertilization, liming, multiple cropping, structure regeneration, land clearing options were conducted. The FCC system as a precursor of extrapolation efforts continued to be tested. Modest extrapolation efforts began in 1978 at San Ignacio, Bolivia, and on farms around Yurimaguas. This phase culminated with the finding that after eight years, continuous cropping is indeed feasible in agronomic terms provided the marketing infrastructure is present. The main impact of this phase was the elimination of the myth that these soils are not suitable for cropping, a finding that attracted international attention because it provided a new outlook for world food production. Land clearing research provided the basis for fundamental changes in Brazil's land development approach in the Amazon. Stage 3: The advent of the Soil Management CRSP and the change in Peruvian government priorities towards the Selva cast the Program in a very different light. Worldwide assessments recognized the importance of research on marginal lands vis-a-vis the green revolution approach. Ecological concerns about deforestation in rainforest areas brought additional attention to soil management research. It became clear that providing the continuous cropping hypothesis with solid, long-term data was a necessary but not a sufficient condition for the utilization of this technology. The program then began to focus on several soil management options suitable for different soil, landscape and infrastructure conditions. A model emerged which considers low input approaches such as use of acid-tolerant germplasm and managed fallows, legume-based pastures and agroforestry (Figure 1). Attention began to be given to the fertile alluvial soils as an important component. The Tropical Soils Program broadened its scope from one option (fertilizer-based continuous cropping) to five. ficant PL-480 funds to support both the physical plant and operations at the Yurimaguas Station. The strengthening of INIPA under the Integral REE Program financed by USAID/Lima, the World Bank and the Interamerican Development Bank resulted in the development of a National Selva Program with 197 research and extension professionals stationed throughout the Selva of Peru. On-the-job training of 46 Peruvian professionals resulted in an extrapolation program operated on-site and financed from sources other than the CRSP. INIPA and USAID/Lima requested a major increase in the training/extrapolation activities. Outside Peru, two major research sites began to test the Yurimaguas technology on a systematic basis: at EMBRAPA's Manaus Station and at Sitiung in West Sumatra, Indonesia. A third site, the Pichis-Palcazu in Central Peru, started in 1984. In addition to the National Selva Program, two additional networks are at advanced stages of development, REDINAA for the Amazon and IBSRAM for acid tropical soils on a worldwide basis. International testing and adoption of the FCC system is in progress in Asia, Africa, Latin America and the United States. Committee was based on the CRSP grant documents, an AID-sponsored review in October 1981 and an NCSU internal review in October 1982. The final version dated 15 February 1983 constitutes our research commitment to the CRSP for the five-year period. The Work Plan includes 72 experiments organized into six projects. The Work Plan defines the overall purpose of NCSU's Tropical Soils Program as follows: "to develop and transfer, together with national institutions and other TropSoils universities, improved soil management technologies for productive and sustained farming systems in humid tropics and acid savanna ecosystems on an agronomically, economically and ecologically-sound basis." The Work Plan lists six specific objectives for 1982-1986. A short discussion of the accomplishments and shortcomings at approximately the midpoint of this period follows. for Soils of the Humid Tropics. Data on crop performance and soil fertility dynamics during the first eight years of the continuous cropping experiment were analyzed during this period and published in articles in Science and the Soil Science Society of America Journal in 1982 and 1983, respectively. The agronomic and economic data plus a hypothesis on their ecological implications were included. This high input-approach was recognized as being limited to areas with ready accessibility to inputs and a good market infrastructure. Examples of such conditions are found in the Alto Huallaga region of Peru and in West Sumatra, Indonesia. During the 1982 internal review, it was recognized that for such continuous cultivation to be truly stable, it has to be mechanized to provide a realistic management of crop residues, weed control and maintenance of physical properties. Deeper plowing resulted in higher phosphorus requirements caused probably by mixing part of the subsoil with fertilized topsoil. Weed control is being studied for the first time on a systematic basis. Systems Based on Low Lime, Fertilizer and Tillage Inputs. 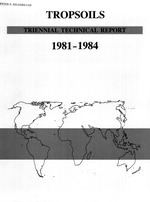 Concentration on low input technology was strongly recommended by the 1981 AID Review of the previous program. A conceptual paper was developed, together with CIAT, summarizing current information on low input technology for acid soils and providing a conceptual basis for the approach. The paper was published in-Advances in Agronomy in 1981 and the Spanish translation in 1983 by the Colombian Society of Soil Science. The strategy is based on selection of acid-tolerant cultivars, minimum tillage and fertilization, weed control and managed allows. The more immediate potential applicability of this approach to small farmers in the humid tropics resulted in major efforts directed toward this objective since the CRSP was initiated. Several key components have come to fruition in the past two years. Upland rice and cowpea cultivars from IITA that combine high yields and acceptable tolerance to pests and diseases with tolerance to high levels of Al saturation have been identified and are now being widely tested through our INIPA collaborators. We have failed, however, to obtain similar results with corn, soybeans, peanuts or winged beans. Screening continues and peanut work is now involving specific crosses made in North Carolina which are tested in Peru. Work with minimum tillage, residue management and their fertility interactions have yet to provide clear evidence of the superiority of minimum or zero tillage, unlike what has happened on Alfisols of IITA. The promotion of faster downward movement of Ca and Mg is being tested. Fertility-weed control interactions are now being studied. A farm level low input central experiment has shown the feasibility of upland rice-cowpea rotations starting with forest clearing with zero tillage, proper spacing and only small rates of N and K have produced a total of 10.3 tons/ha of rice and 2.1 of cowpeas during the first two years. Flooded Rice on Alluvial Soils. pastures in the udic tropics with low animal productivity which decreases and leads to overgrazing and subsequent soil erosion. Pasture establishment problems have been alleviated by experience and better seed sources. Regenerating degraded Panicum maximum pastures on farmer fields was simply accomplished by broadcasting Bayovar rock phosphate. The principal problem seems to be the low nutritional quality of some grass:legume mixtures which is reflected in relatively low liveweight gains per animal. Initial work in this direction has identified high tannin content as a constraint. Phytotron work in Raleigh is testing the hypothesis that sulfur deficiency may be responsible. Plans are underway to validate initial observations of incipient nutrient recycling in well managed grass-legume pastures at Yurimaguas. The question of whether to use legumes at all is to be studied in a nitrogen transfer experiment. Research on agroforestry continues to increase. After observational trials on Gmelina arborea intercropping and peach palm (Guilielma gasipaes)-legume interrows, work has centered on establishing the nutrient response patterns of Gmelina and peach palm on a systematic basis. The first, to our knowledge, fertilizer trial of peach palm in acid soils shows a very strong N response and also to other nutrients. Germplasm collection of this valuable species is taking place, as Yurimaguas is one of its centers of origin. These studies have led to the awarding of an IDRC grant through ICRAF for agroforestry research in Yurimaguas. Alley cropping work began in 1983 with the overall purpose of finding species that can do in acid soils what Leucaena leucocephala does in high base status soils. One trial with several promising species is ongoing and germplasm collection from sources in the Amazon, Africa and Southeast Asia continues. The question on how fallows regenerate soil productivity is being evaluated on a preliminary basis and more intensive research is now being done in the library to develop hypotheses and future plans. grown during two years with an average production of 16.5 tons/ha/yr. Replacing transplanting with pre-germinated broadcasted seed depressed yields by 20% but decreased labor input for crop establishment from 20 to 3 man-days/ha. Indonesia and REDINAA Soils Network. The request for assistance in the Selva of Peru resulted in consideration on the adaptation of the Yurimaguas results to special project areas. We expressed the need to validate the results first to make sure that local adaptations could be incorporated. It became apparent that research workers needed prior training to validate and transfer the results in a sound manner. The frequent request for short-term (1-2 weeks) training made it necessary to make on-the-job training a formal activity. During 1982 and 1983 a total of 58 professionals received onthe-job training at Yurimaguas. The 51 Peruvians came from most areas of the Selva and include researchers, extension specialists, farmers and representatives of native communities. Other training activities include graduate students from Argentina, Finland, Germany, the Netherlands and the United Kingdom. Ten NCSU graduate students are in different stages of conducting their theses research at Yurimaguas or in adjacent areas. National Selva Program: the National Tropical Pastures Network and the Agroforestry Project. Internationally recruited staff from CIAT and ICRAF will participate in these projects.